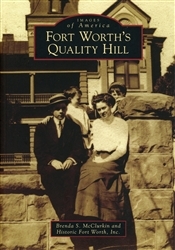 In the late 19th century, Fort Worth's Quality Hill succeeded Samuels Avenue as the city's prestigious residential neighborhood. Cattle barons, bankers, attorneys, and business entrepreneurs selected this west-side locale to construct exquisite homes that reflected their wealth and prominence in the community. Bounded by Seventh Street on the north, Pennsylvania Avenue on the south, Henderson Street on the east, and the Trinity River on the west, the area had an unequaled civility. Quality Hill set the standard for fine living, elaborate entertaining, and philanthropy. Just a handful of these gracious homes have survived the years. Fort Worth's Quality Hill offers you an opportunity to explore this historic neighborhood in its finest and waning days. 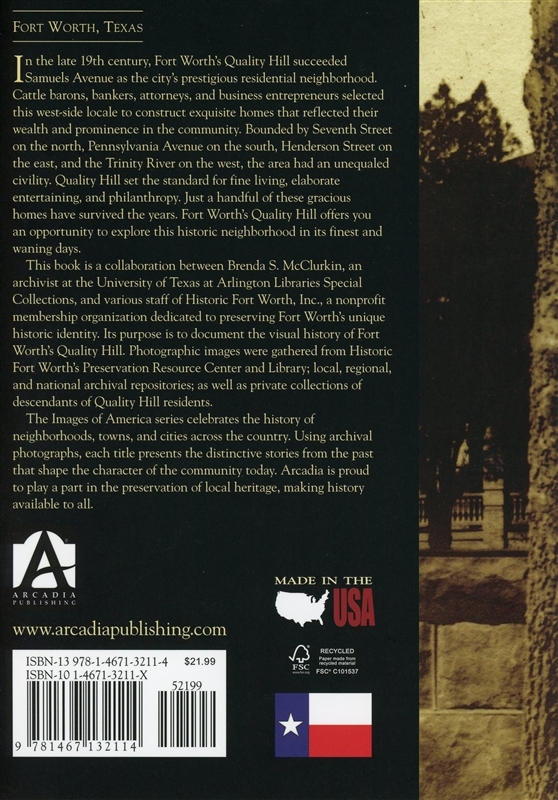 This book is a collaboration between Brenda S. McClurkin, an archivist at the University of Texas at Arlington Libraries Special Collections, and various staff of Historic Fort Worth, Inc., a nonprofit membership organization dedicated to preserving Fort Worth's unique historic identity. Its purpose is to document the visual history of Fort Worth's Quality Hill. Photographic images were gathered from Historic Fort Worth's Preservation Resource Center and Library; local, regional, and national archival repositories; as well as private collections of descendents of Quality Hill residents. Published by Arcadia Publishing September 2014.